Saturday brought a light volume of polling data, and the FiveThirtyEight forecast was not much changed. Barack Obama’s chances of winning the Electoral College are 77.5 percent, according to the model, slightly improved from 76.9 percent in Friday’s forecast. Mr. Obama’s numbers also held steady, at a four-point lead among likely voters, in a United Press International national poll, which is being published roughly once per week. Over all, Saturday’s data seemed like a total wash — so why did Mr. Obama’s forecast improve, even incrementally? The reason is that we are now getting to the point where a neutral day in the polls can be thought as being ever-so-slightly favorable to Mr. Obama, since he leads in the race and since Mr. Romney now has only 45 days to make up the deficit. This will be especially true over the course of the next week or so, during which time the penalty that the model has been applying to Mr. Obama’s polls because of the potential aftereffects of the Democratic convention will phase out. Another way to look at this: Mr. Obama’s win probability in our “now-cast,” which is our estimate of what would happen if the election were held today, is 95.8 percent. (The “now-cast” also does not apply the convention bounce penalty to Mr. Obama’s polls.) As Election Day draws nearer, the forecast will converge toward the now-cast, until eventually they are exactly the same on Nov. 6. Still, you should generally not read very much into changes of such a small magnitude in the FiveThirtyEight forecast. The probabilities that we report are based on 25,001 simulations that we run each day. That’s a lot of simulations, but it still leaves a small margin of error of about 0.5 percentage points on the daily win probability estimates. The more significant trend is that Mr. Obama’s forecast has been moving upward for several consecutive days; his current win probability of 77.5 percent is up from 72.9 percent on Tuesday. Unusually, the U.P.I. poll had Mr. Obama with a larger lead among likely voters than among the broader universe of registered voters, with whom he led by roughly two percentage points instead. Most polls this year have shown that Mr. Obama’s numbers are worse among likely voters than among registered ones. We diligently keep track of national and state polls that report both registered voter and likely voter numbers since they are instrumental in the likely voter adjustment that the model applies. An initial round of polls completed just after the Democratic convention suggested that the gap between the two sets of results had narrowed, although since then we’ve seen results that are all over the place. An Associated Press poll earlier this week, for instance, had Mr. Obama with a 10-point lead among registered voters but just a one-point lead among likely voters, making for an enormous nine-point “enthusiasm gap” in favor of Mr. Romney. But then there are scattered cases, like the U.P.I. poll or last week’s Fox News national survey, in which Mr. Obama actually did better in the likely voter version of the poll. Likely voter models are a necessary evil — and polls will normally overstate the performance of the Democratic candidate without them. But there are so many different ways to apply them — some of which are clumsily designed — that they can sometimes make the data noisier. 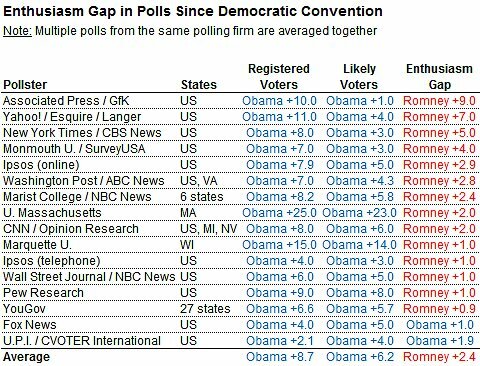 Still, most polling firms are clustering in the range of showing Mr. Obama performing one to four points worse among likely voters than among registered voters. For some reason, the gap seems to be smaller in state polls — where it has averaged about 1.5 percentage points in polls published since the Democratic convention — than in national polls. Most of the state-level polls are of swing states, and it is theoretically possible that Mr. Obama’s “ground game” is having some favorable impact in these places, helping to reduce the turnout advantage that Republicans normally enjoy. If so, it is possible that Mr. Obama’s position would be stronger in the Electoral College relative to the national popular vote. Still, because there has been so much divergence in pollsters’ estimates of the enthusiasm gap, and because the mix of polling firms is somewhat different at the state and the national levels, I think we will need to see another couple of weeks’ worth of data before we can come to too many conclusions about this. For the time being, the model evaluates the Electoral College as being a fairly neutral factor this year, or perhaps even one that slightly favors Mr. Romney. Part of the reason why is that, although Mr. Obama has had fairly strong polls since his convention in the swing states, he has also shown improvement in his polls in large-population blue states like California, New York and Massachusetts. If Mr. Obama wins California by 25 points rather than 20, for instance, that would increase his share of the national popular vote by 0.5 percentage points. But these votes are wasted in terms of the Electoral College since Mr. Obama was all but certain to win California anyway.